We are one of New Zealand's foremost Retaining Wall Construction companies. It all began in Wellington in the mid 1980's, with a small company constructing Crib Wall retaining units. Builder Chris Burke saw the potential and bought the company. Within a few years the company expanded to meet growing local demand, and began both making, and installing the retaining wall units. 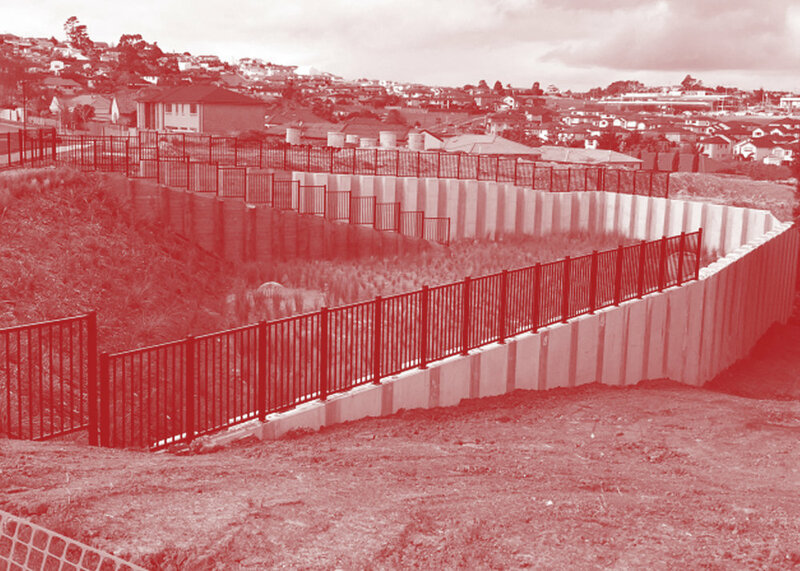 Seeing the increasing opportunities in other parts of the country, Chris made the move to Auckland, and in 1994 ICB Retaining Walls Limited began offering the full range of retaining wall construction options. Since then the company has carried out numerous projects for Construction companies, City Councils, Railways, NZTA, Mining and Harbour Companies. The company is a trusted designer and builder of a large range of retaining wall solutions and its success is reflected in its continuing growth by offering a proven record of experience, innovation and reliability. We are just as confident about the future. We have a key group of expert staff and a number of experienced contractors, who work together to complete projects in a timely, innovative and professional manner. Chris and Regan are ICB’s leaders and they not only drive the business to develop, innovate and positively contribute to the industry and the wider community, but they maintain a strong focus on growing the business and building a culture that keeps people, their development and safety at the heart of the business. Chris has operated his own company since 1975, and has been the driving force behind ICB Retaining And Construction Ltd. He has an in-depth knowledge of all aspects of Retaining wall Construction and Design. Chris was Chairman of the Auckland branch of the NZ Contractors federation, now known as CCNZ (Civil Contractors New Zealand) He was untill recently an Executive member of CCNZ and is also Executive Member of the Auckland Business Forum. Regan is a qualified carpenter with over 18 year’s experience in Civil works specialising in retaining wall construction. He has been with the company from an early age as a skilled labourer and has come up through the ranks to now being the General Manager. Regan has been an Executive committee member of Civil Contractors New Zealand Auckland Branch since 2012, he holds a SiteSafe Supervisors Gold Card and is a Connexis Workplace Assessor. Regan has been running the Auckland Heat of the National Excavator Operator Competition at Big Boys Toys since 2012. Greg is a qualified automotive Engineer, with broad experience in administration. He takes the leading role in ensuring we meet the highest standards in health and safety management. Gary joined ICB in May 2016 as our Construction Manager. He is a qualified Civil Engineer with 27 years’ experience in civil engineering & management which includes subdivisions, large airport upgrades in Abu Dhabi ($60m) and infrastructure (roads, pipe lines) for the oil industry ($940m). Zeinab is our Engineering / Estimating Manager who has 7 years experience with ICB in civil engineering projects, price estimation and construction of retaining walls. Sheryl joined ICB in April 2016 as the Estimator/QS Assistant. She has 15 years Project Management, Design, Estimating and Tender Preparation, Quality Assurance Manager for Design and Estimating within the Telecommunications Industry in both Copper and Fibre including Commercial New Builds, Roadworks and Subdivisions. Fibre to the Node, Rural Broadband Initiative, Ultra-Fast Broadband, New Generation Access. May has a BSC in Survey Engineering, and has 33 years experience in major projects, including site surveying, quantity surveying and survey estimating. May has had 20 years experience in accounting and office work here in New Zealand of which 13 years has been with ICB. Annette joined ICB in June 2016 as the Resource Manager after working for Connexis the Infrastructure industry training organisation since 2005. She looks after Recruitment, Training and Health & Safety. She is a qualified teacher and has 15 years’ experience in Adult Education and training. She is passionate about Health and Safety and aims to keep our people safe in their work environment. Annette runs our ConstructSafe Test Centre. Andre joined ICB in June 2015 as the Plant & Equipment Manager. He was trained in South Africa as a diesel/petrol mechanic and has 20 years experience in plant repair and servicing. He keeps our fleet of vehicles and plant and equipment working efficiently. Please contact Andre on 021384417 if you have any query about or fleet of trucks, plant and equipment. Michaela is our Accounts Manager. She has over 40 years experience in the accounting sector of which 15 years at ICB. Richard is our Area Supervisor North with 24 years experience in general civil engineering projects, including 15 years with ICB. He has worked on a wide range of retaining wall projects. He is an indentured carpenter by trade and he is from a civil engineering background. Graham is our Central / West Area Supervisor with 20 years retaining wall construction experience with ICB from its early beginnings. Graham has worked his way up through the ranks and has extensive knowledge of all aspects of earthworks and retaining walls. Dean joined ICB in May 2015 as the Area Superviser South. He returned to New Zealand after a stint in Australia working on the mines. He has 40 years experience in general civil work. We are committed to providing a safe and healthy workplace to ensure the wellbeing of our employees, our clients, and members of the public. Our goal is to eliminate all injuries, accidents, and incidents. ensure that our regular planned inspections include monitoring of current Passports in workplaces we control. All new staff are supervised and trained until they reach our required Health and Safety standards, with regular competency assessments and are provided with all necessary Personal Protective Equipment (PPE). This PPE is always required to be worn on all our worksites. ICB has its own ConstructSafe test centre. The ConstructSafe Scheme is the first of its kind in New Zealand and is one way to independently assess the competency of any person, anywhere. It is based on international best-practice frameworks and sets a benchmark for health and safety competency. We offer this service to our clients so that all people working on site are competent and safe. ConstructSafe provides a consistent and transparent way to independently check the competency of any worker, trade specialist, supervisor or manager on site regardless of their employer. On all projects we plan ahead to identify, risk assess and control all hazards on-site. We hold regular safety meetings to ensure our employees have the right plant and skills needed to work safely and control these hazards. We also keep in close communication with all subcontractors working on-site under the ICB umbrella to ensure they comply with all health and safety requirements. We monitor our sites to ensure our planned controls are effective and our employees and subcontractors are supervised to ensure they are acting safely. All these measures prove highly effective. We believe it’s our responsibility to work in a manner that meets the needs of today, without compromising the needs of future generations. doing what’s best for the communities in which we live and work. leaving a legacy of craftsmanship and permanence, that enhances our local communities and provides clients with long-term quality assets. going paperless by using the EasyForms app for all our reporting, which will consequently produce improved work systems and improved efficiency. Investing in our People is essential characteristic of our business. We continually work on people development to progress their career aspirations as well as negotiating effective ways to develop their capabilities so their process is meaningful and worthwhile. We believe that we achieve a competitive advantage by developing a thriving and capable workforce. Ensuring all staff enjoy a work-life balance, while working on landmark infrastructure projects which will be around for a long time. As a business we have made a commitment to continuous innovation to improve delivery and provide measurable, sustainability gains. EasyForms – the introduction of this highly accessible online application has enabled greater ease of onsite reporting for all staff and more accurate planning, all of which has led to significant productivity and profitability improvements. FleetAgent – through the use of FleetAgent GPS technology, we are now better able to track all ICB plant and machinery, it’s use and by who, all of which has led to major maintenance, efficiency and safety improvements. Because FleetAgent is fully compatible with EasyForms, this also provides additional efficiencies. We have recently incorporated machinery checklists within the EasyForms Application to ensure our plant is regularly checked before work commences and our new FleetAgent GPS system now updates EasyForms with live data. We are currently working on integrating these applications into our job costings and creating multitude of dashboards so we can see accurately how jobs are performing in real time. The recent introduction of group sharing functionality on the CivilShare App has better allowed us to share our excess resources within our internal teams.